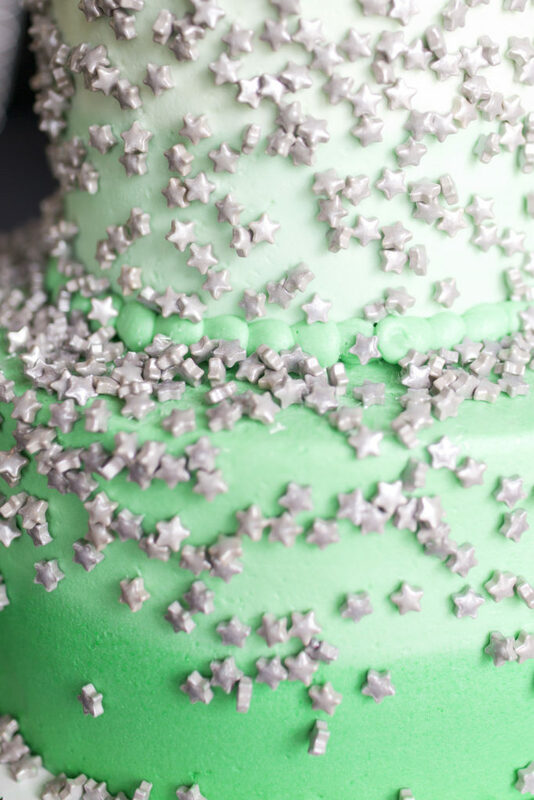 One of the biggest events in any woman’s life is her wedding day and there are so many wonderful moments leading up to the big day worth celebrating! 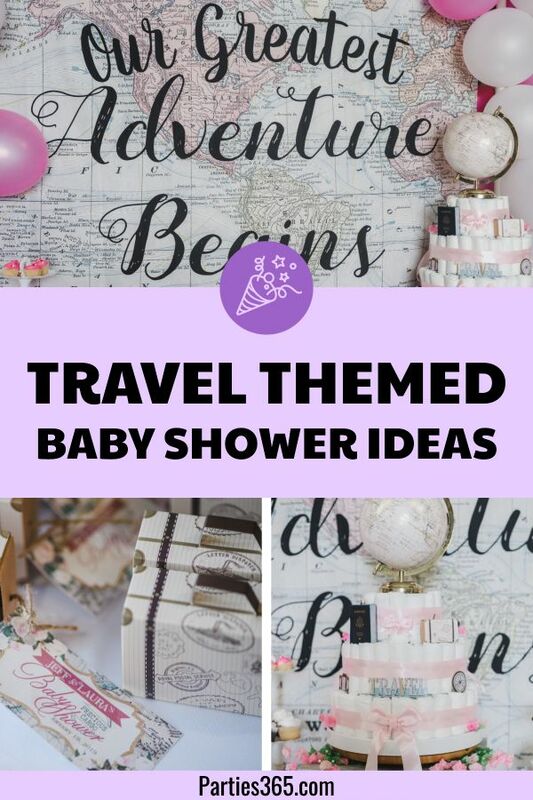 A Bridal Shower is the perfect time to gather friends and family and celebrate all the joy, love and excitement the future is sure to bring! 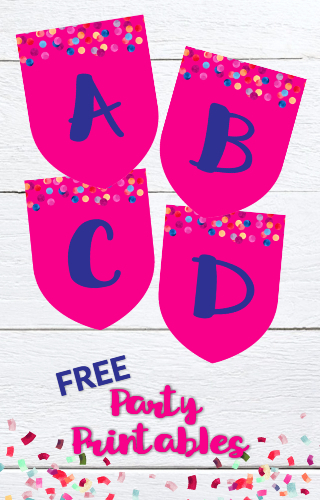 You can’t go wrong basing your party theme on one of the bride’s favorite things (and a pun never hurts either, does it?)! 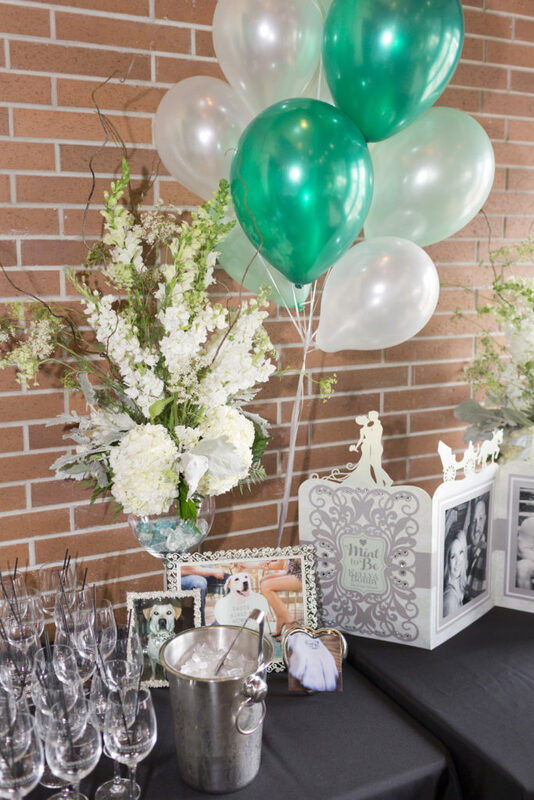 Bride-to-be Kelly has always loved the color green, so a colorful “Mint to Be” Bridal Shower was destined to be the perfect fit! 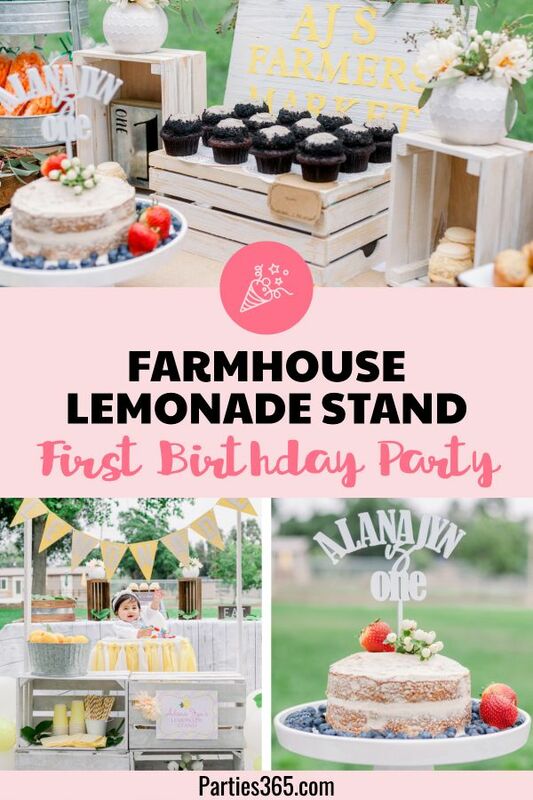 Join me as we take a look inside this fun and fresh bridal shower to gather inspiration for your next party! 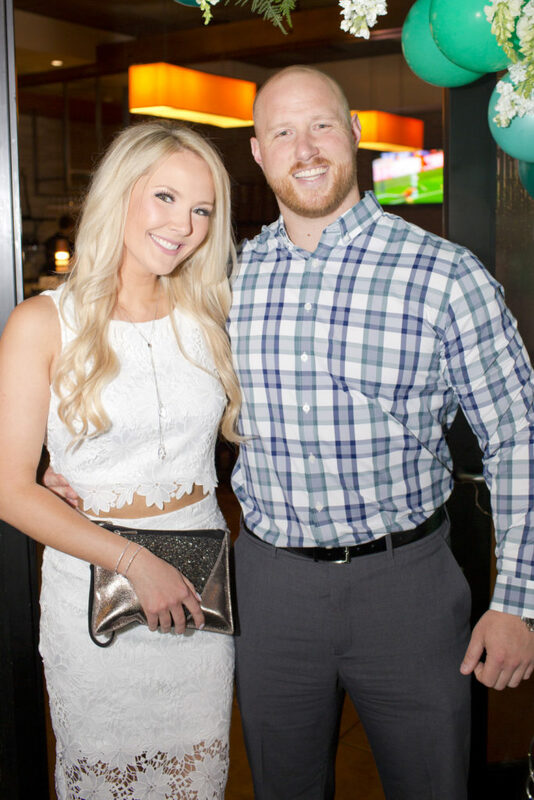 Bride-to-be Kelly adores The Barrel Room at Cooper’s Hawk Restaurant in South Barrington, Illinois so picking a location for the bridal shower was easy. 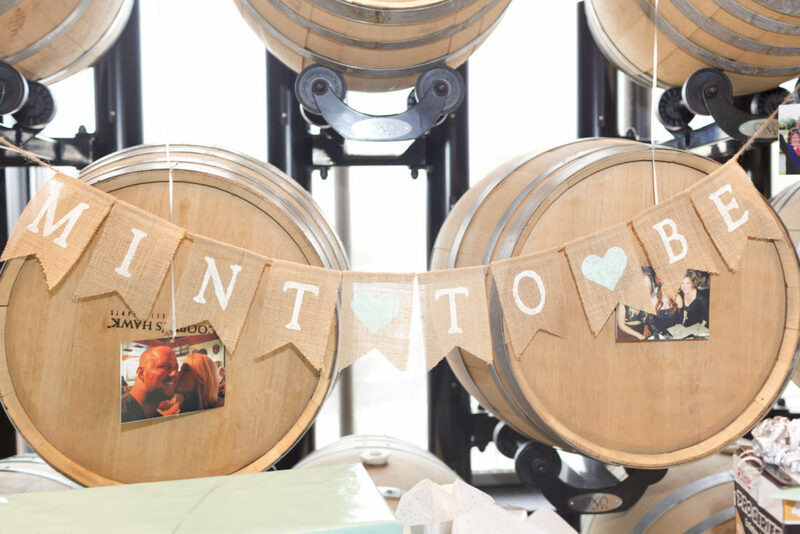 The unique ambiance created by a room full of wine barrels was the perfect backdrop for the couple’s shower. 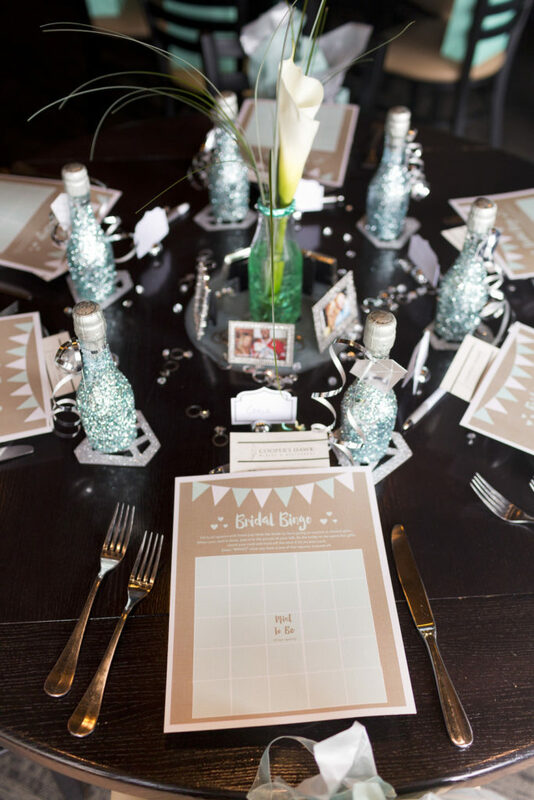 Isn’t that burlap “Mint to Be” banner adorable?! You can get one just like it on Etsy! 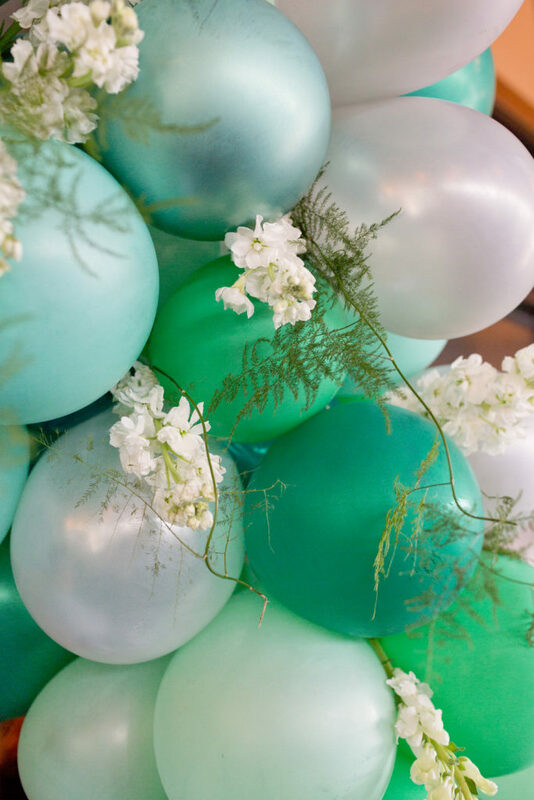 Guests were greeted upon arrival with a playful hand drawn chalk Welcome Sign and a stunning mint green balloon arch, interwoven with ferns and flowers. A chalkboard sign like this is an easy way to customize the welcome for your friends and let them know they’re in the right place. 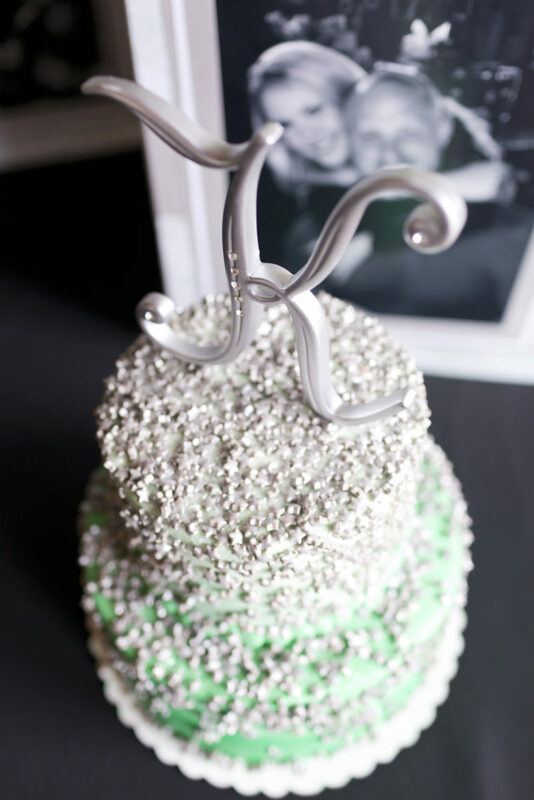 Plus, the balloon arch, made with balloons a few different shades of green and pearl white is stunning. 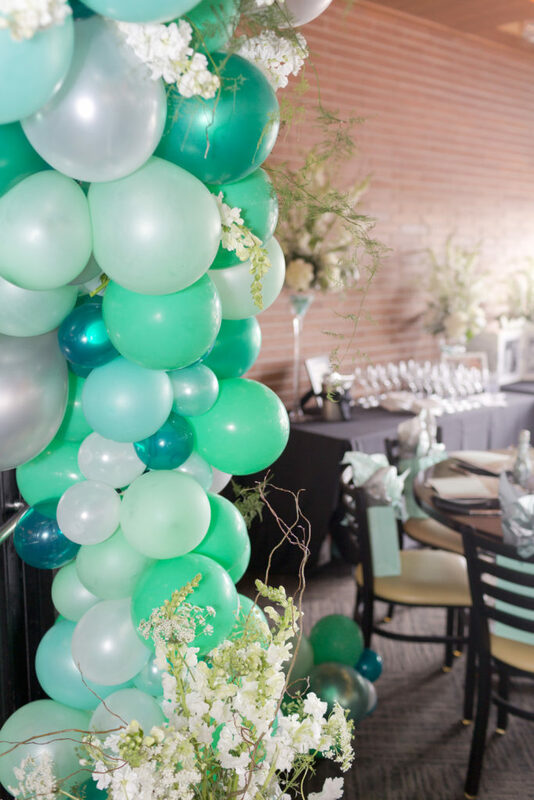 It’s easy to add in flowers and greenery to your balloons to take the elegance level up a notch or two! Kelly and Bobby’s wedding ceremony will take place in northern Michigan in front of the gazebo at the Mission Point Resort on Mackinac Island, one of the bride’s favorite places. Mackinac Island is a unique historic site and Michigan summer tradition. To pay homage to Mackinac Island, Kelly’s aunt had a friend design a beautiful accordion photo display where each panel held a black and white photo of Kelly and Bobby and a unique Mackinac Island related cutout at the top, including a dancing couple, a horse and carriage, a gazebo, and the Mackinac Bridge, which was displayed on the cake table. Other decor for the Mint to Be Bridal Shower included stunning floral arrangements by Barrington Flower Shop on a table where guests could share Words of Wisdom and Date Ideas with the married couple-to-be. 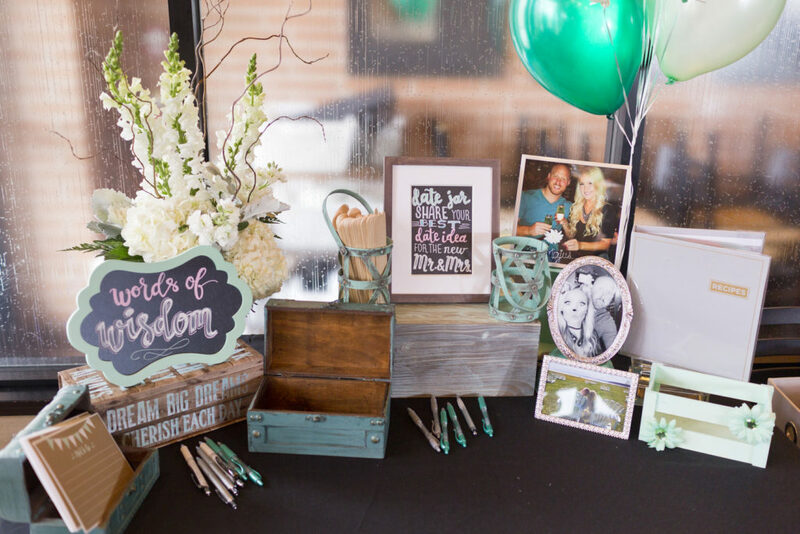 We love how all the accent pieces, boxes, pens and frames are in different shades of mint green! 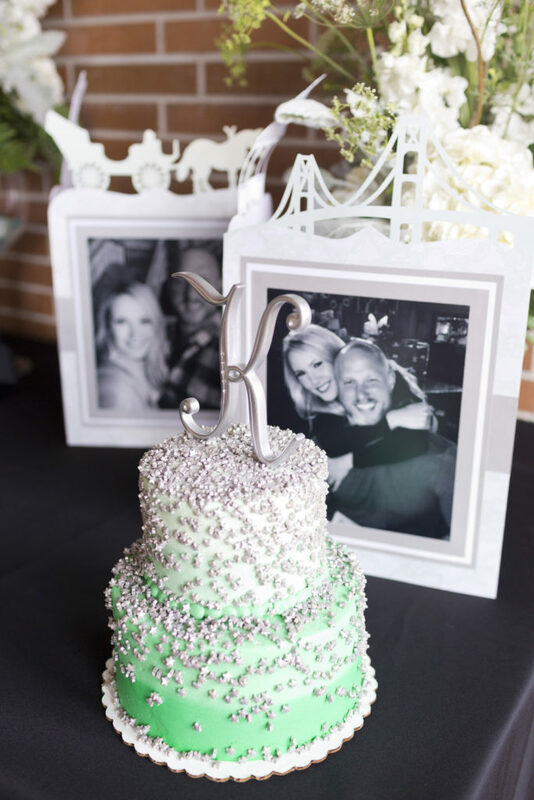 Guests enjoyed a lovely cake, designed by Mariano’s, which was the perfect compliment to the party’s theme in a light mint green ombre, covered in silver sugar star confetti and topped with a sparkling letter “K” for bride-to-be Kelly! 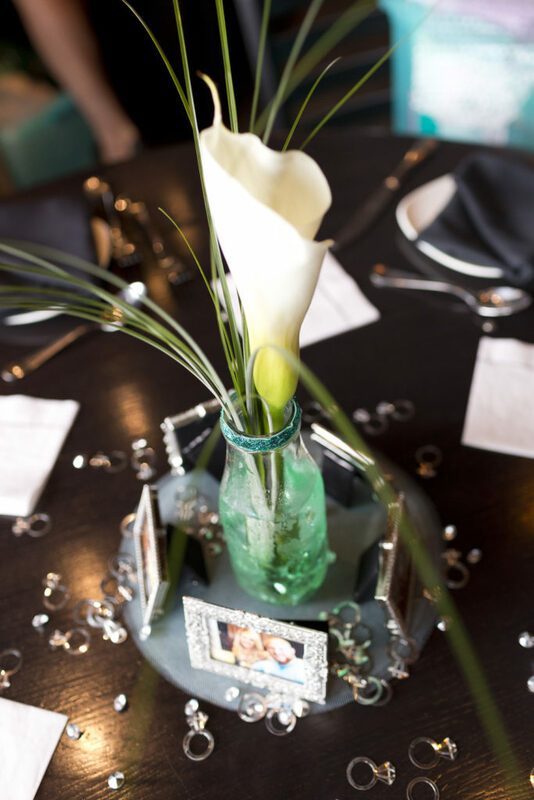 Guests dined on beautiful black tables decorated with a single white calla lily in a mint colored milk jar, along with diamond confetti and mini picture frames with photos of the couple, which also served as favors. 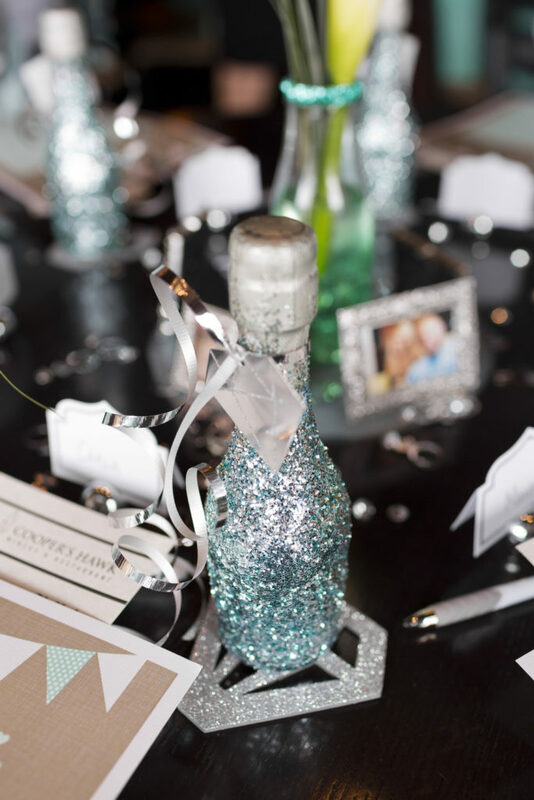 Each place setting also included a custom card for Bridal Bingo as well as a mini bottle of champagne covered in mint glitter – always a welcome take home favor and an easy DIY project! 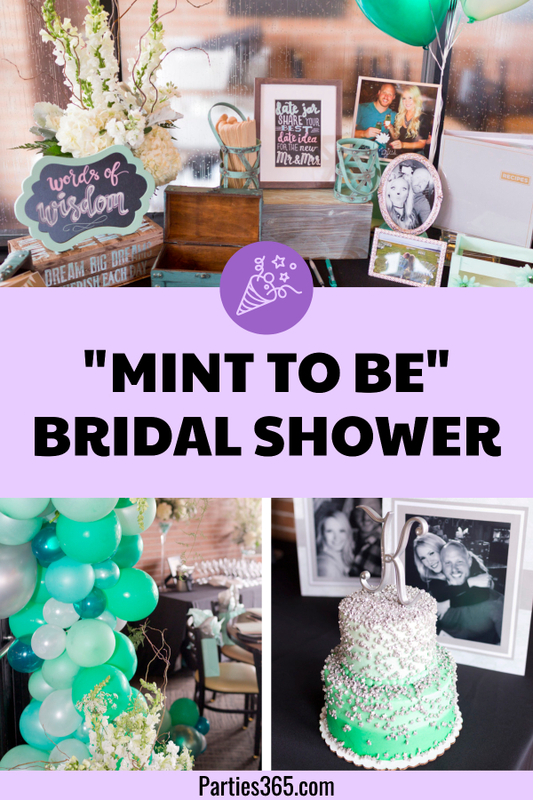 We hope you pulled some fun and fresh inspiration for a Mint to Be bridal shower theme for your next celebration! 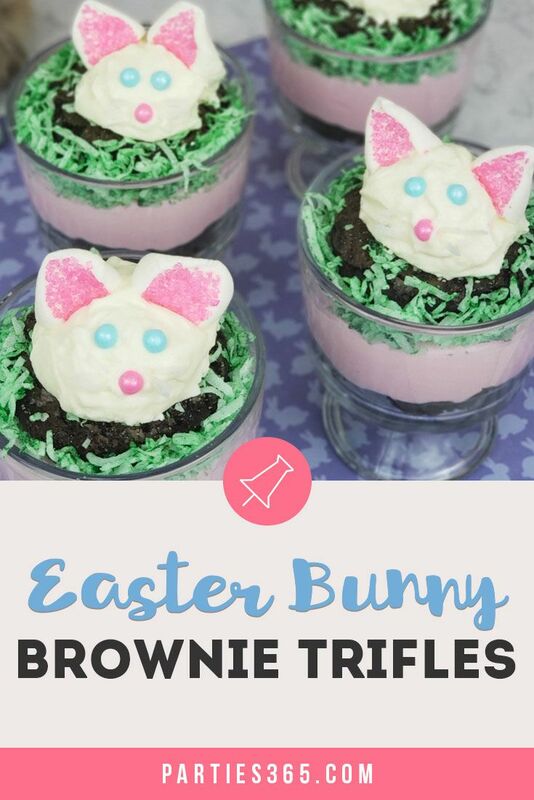 Be sure to Pin this post for later, or share it with your favorite bride!